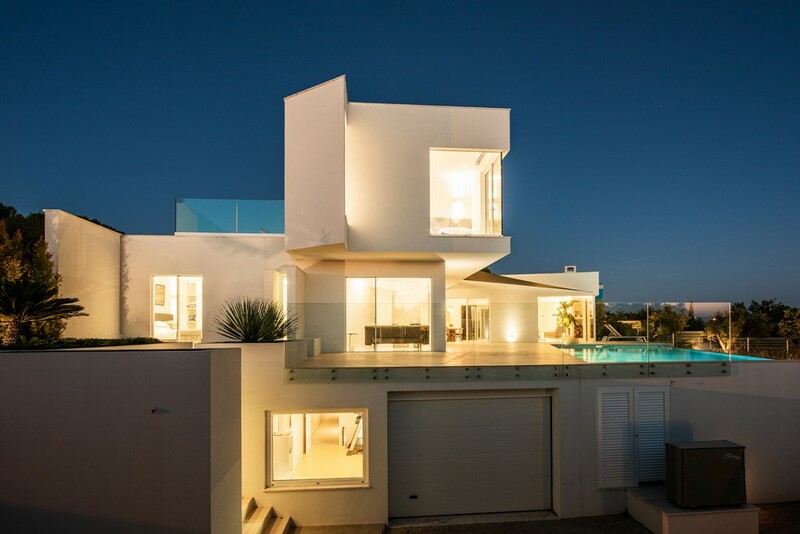 An actual interpretation of the Mediterranean Modernist Architecture in a balanced fusion with Portuguese Cubist Architecture references. 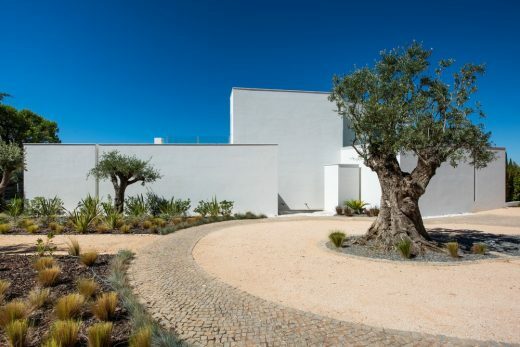 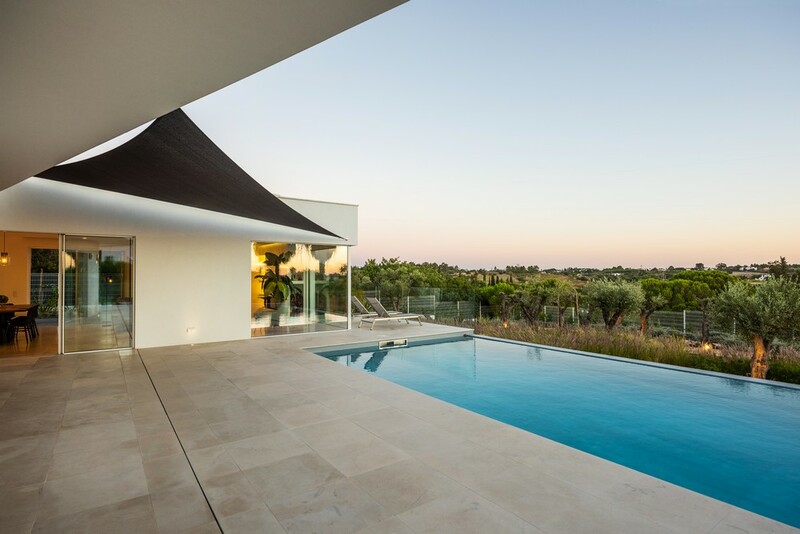 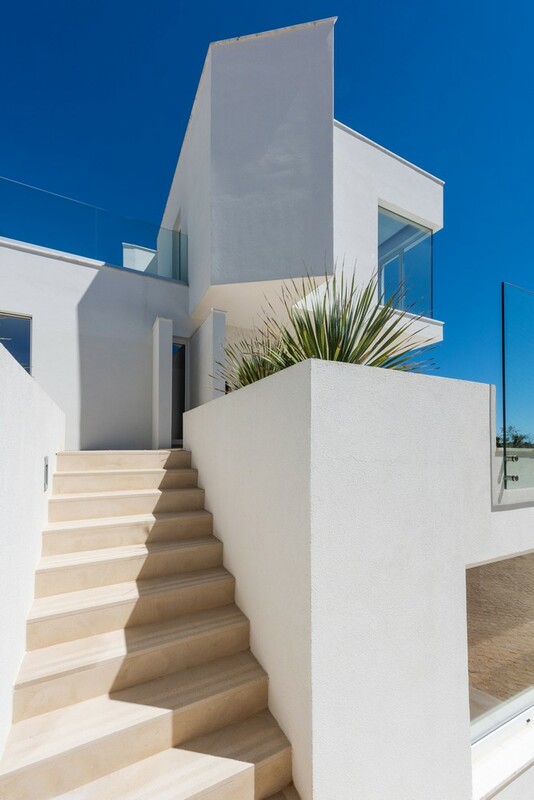 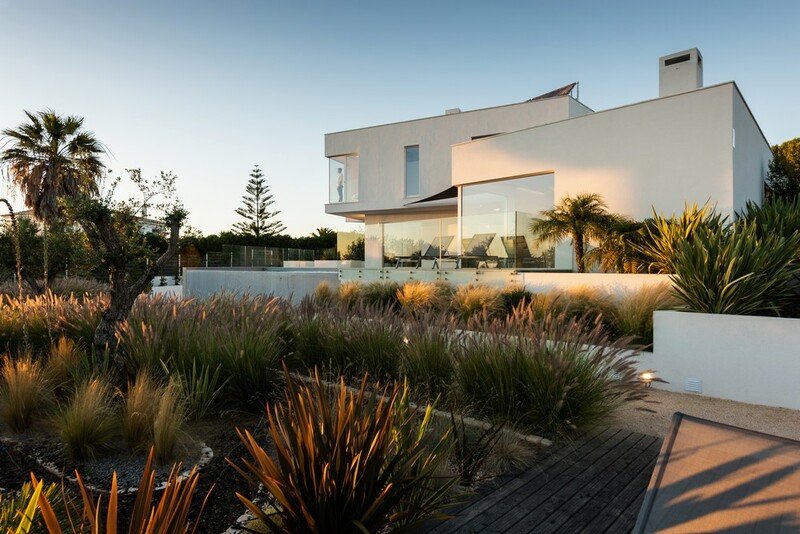 A pure white minimalistic contemporary family house located at Quinta dos Salicos, Carvoeiro, Algarve (Portugal). 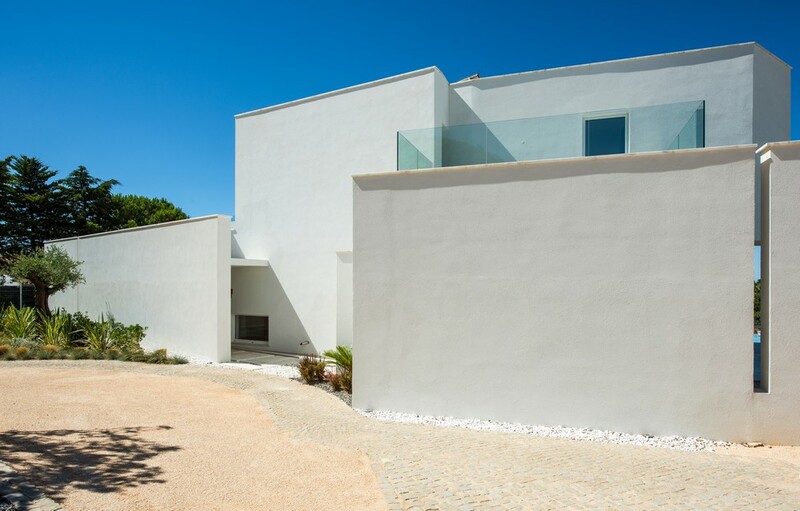 Based on a natural organic layout design, the main shape (trapezoidal) of the building is following the plot’s itself shape and directing the different facades for the most efficient, sunny and pleasant views, in a constant open visual and physical relation between indoor and outdoor spaces (natural fusion). A concept with pure straight lines, uniform colors (white), flat roofing (living terraces) and volumes shaped by the irregular angles and defined by the relation between light/shade over the irregular volumes setting. 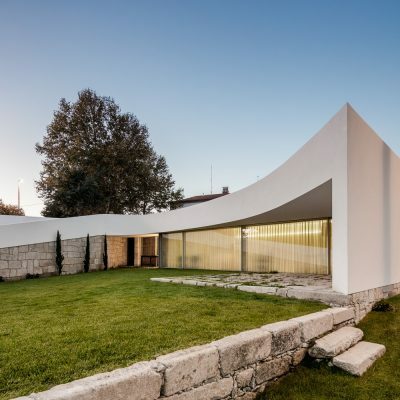 A building concept following an eco-friendly approach based on optimizing the climate and natural lighting/ventilation conditions. The ground floor volume is parallel to the plot’s side limits. The almost “blind” northern facade contrast with the remaining facades, where the three volumes with generous glazed plans orientated in different angles, build the relation between the house, terraces and the landscape. The first floor follows the same concept with a “clean” north facade. 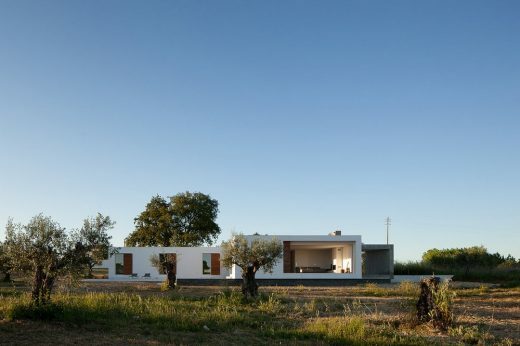 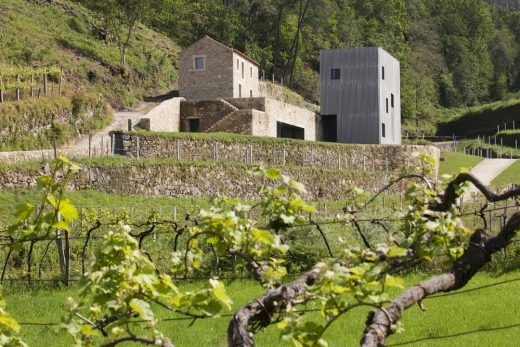 The remaining facades and their irregular plans emphasize the relation with the landscape and sunlight. 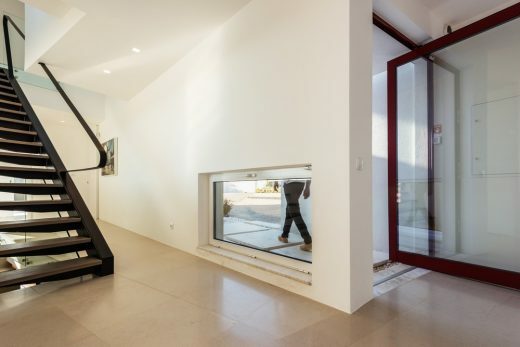 The functional program is organized in three levels. 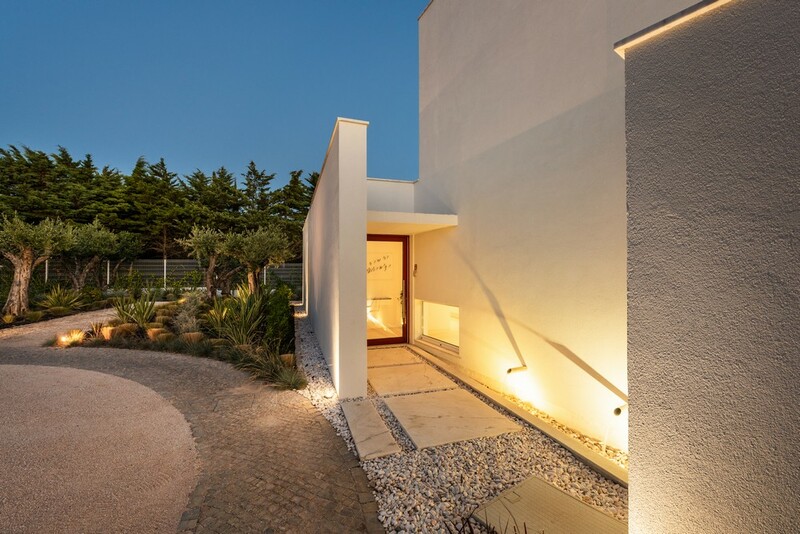 The parking, storage, technic area, cinema and gym room are located in the basement floor, built naturally following the natural slope of the plot. 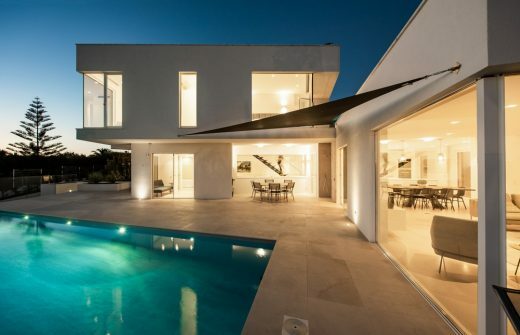 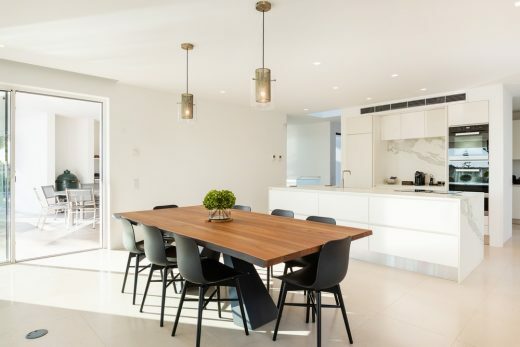 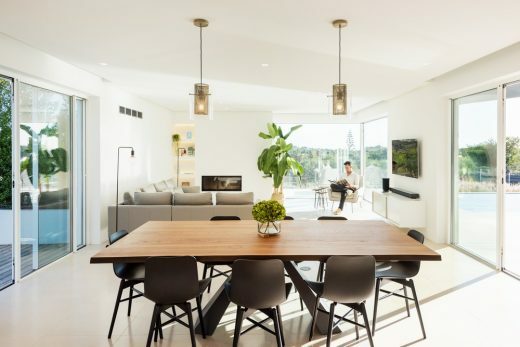 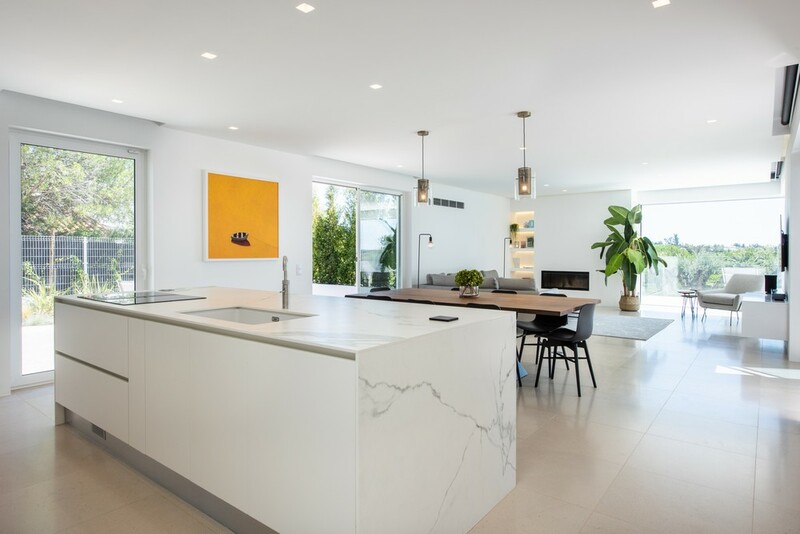 The ground floor is composed by the social areas, where the kitchen and living space are connected fiscally and visually throughout the large glass windows to the main terrace next to the swimming overflow pool. 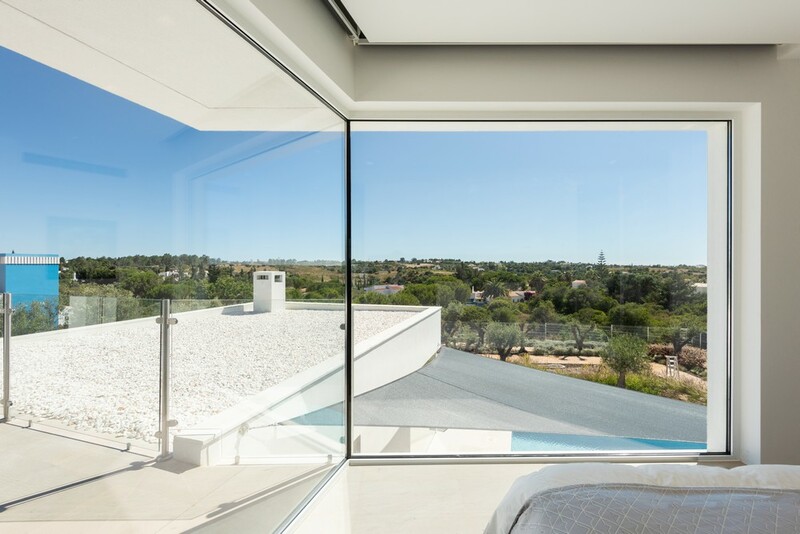 There’s also a more private area orientated to west contemplating a bedroom with private bathroom and a multifunctional room. 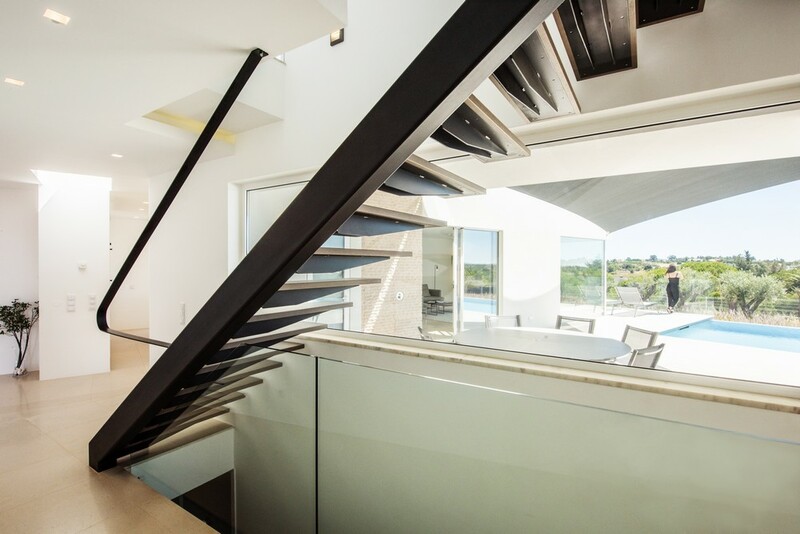 The light and sculptural metal stairway connects the ground floor to the private program of the first floor, contemplating a master ensuite bedroom with bathroom and a guest ensuite bedroom, both with private terraces balanced into south/west and north/west with country, sea and mountain sunrise and sunset views. Two platforms that merge with the natural slope of the plot, following the alignments and the irregular morphology of the house based the main concept to design the front south terrace and pool area. 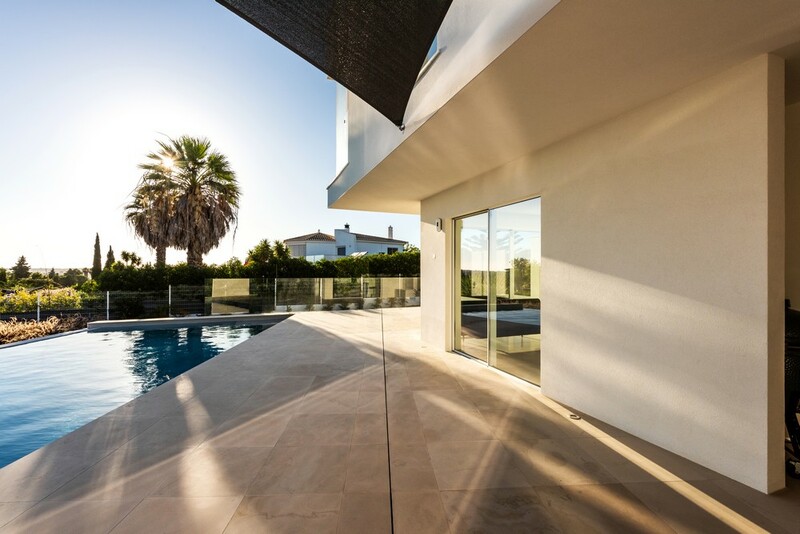 The first platform is at the ground floor level, next to the main terrace orientated to the sunset position. 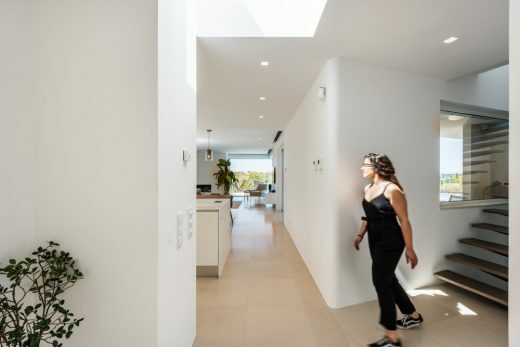 A second platform on a lower level integrates the collector tank for the overflow pool’s system and sets the connection between the first platform (higher) and the garden zones. 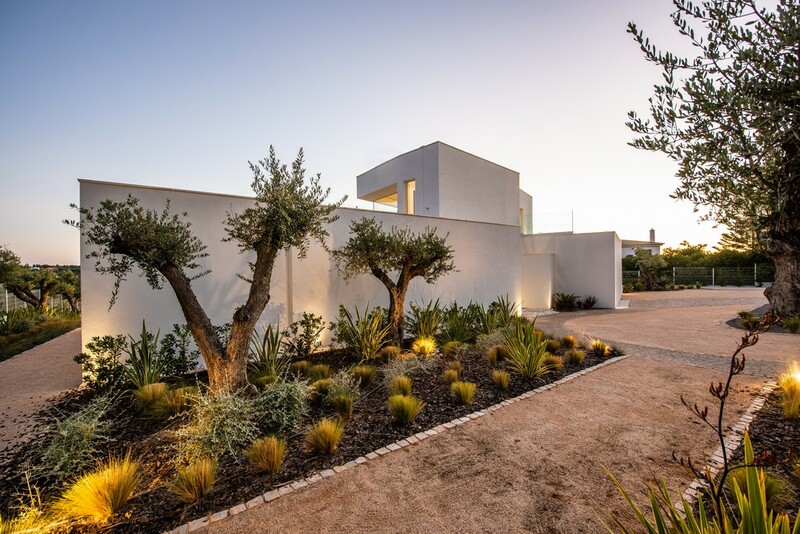 An organic Mediterranean dry garden concept with reduced maintenance (low water consumption), that respects the original slope of the plot where low vegetation is surrounded by white gravel trills and some olive and fruit trees are involved by pine bark. The minimal, low maintenance concept with Portuguese inspiration, using local materials is also present on the exterior circulations and main entrance access where coble stone flooring was used to define the paths. 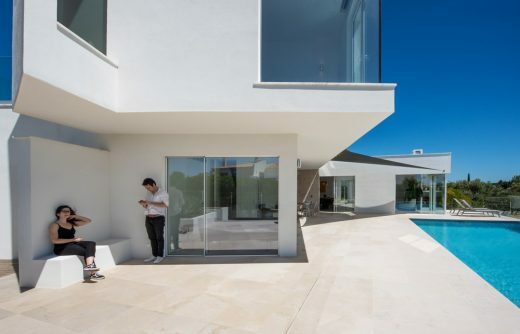 In general, the house is developed in between ‘two worlds’, on the ‘first world’ in the north zone (entrance) the house is behind privacy plans (wings) which define its mystic effect and privacy control on the transition to the ‘second world’, completely dynamic, open, fluid and constantly in contact with the lounge zones (terraces/pool) and natural surroundings (Mediterranean dry garden concept and country/sea horizon views).